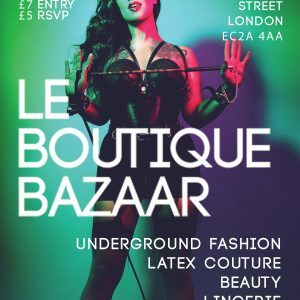 It’s time for our second annual Springtime Soiree, and this one is special indeed- because it’s timed perfectly for you to buy fabulously hot looks for Torture Garden’s 25th anniversary gala, German Fetish Ball, FF weekender and the multitude of other fantastic international events this spring. It’s also the last one till autumn- so make sure you come join us for a cocktail! Designers will be selling items for immediate purchase on the day, but will also be taking deposits for pre-order, allowing you a chance to meet with them, see garments in the flesh, and discuss your requirements, making purchasing that special item even easier…..